San Francisco health psychologist and biofeedback pioneer Erik Peper is the president of the BFE, and has provided direction since the organization’s charter meeting in Davos Switzerland in 1997. The Thought Technology Ltd. company of Montreal, Quebec, has been the major sponsor since 1997, and other corporate sponsors contribute to the success of the organization and its annual meetings. Saybrook faculty member Donald Moss is on the Advisory Board of the BFE and is a consulting editor of Psychophysiology Today. Dr. Moss has taught and provided keynote speeches and symposia presentations at BFE meetings in the Netherlands, Italy, Germany, Austria, Switzerland, and Poland. 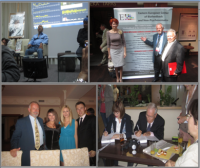 The 2012 BFE meeting took place in September 2012, in Rzeszow, Poland. Highlights of the meeting included: 1) a four day presentation on neurofeedback therapy for Attention Deficit Disorder by Michael and Lynda Thompson of Toronto, Canada; 2) a keynote address and two day workshop on the treatment of female sexual pain by Marek Jantos and Sherie Johns of Adelaide, Australia; 3) a keynote address and two day workshop on the use of heart rate variability biofeedback for medical and emotional disorders by Donald Moss of San Francisco, California; and 4) a one day workshop on EEG assessment by Francois Dupont of Quebec, Canada. In addition, Howard Hall of Cleveland, Ohio, provided demonstrations on the voluntary control of pain, involving Sufi practitioners, who submitted to piercings with sharp stainless steel skewers, while they utilized a focus on a spiritual guide to maintain a calm state during the piercings. The photos accompanying this blog entry show (left to right and top to bottom): a Sufi submitting to a skewer through the base of his mouth, while his physiology is recorded, a photo of Saybrook faculty member Donald Moss with faculty of the East European Center for Biofeedback and Noo-Psychosomatics; Moss again with Polish graduate students who are studying biofeedback; and Michael and Lynda Thompson signing copies of their new book on neurofeedback.